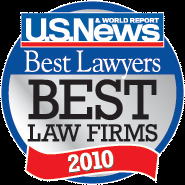 Tenn And Tenn, P.A., is proud to have been included in U.S. News and World Report Best Lawyers “Best Law Firms” for 2010. The firm received merit in Family Law in Manchester Tier 1. These rankings feature data on close to 9,000 law firms in the United States. To determine the rankings, an extensive survey was conducted in which thousands of law firm clients, marketing and recruiting officers, leading attorneys and law firm managers, as well as associates and partners were surveyed. Close to 114,000 surveys were sent to these individuals and organizations. All were asked what aspects they considered to be vital for attorneys selecting a firm to refer cases to, for attorneys seeking employment, and for clients hiring a law firm. The surveys for clients and attorneys mostly collected reputational data. Clients voted on whether they were refer another client to the law firm, responsiveness, cost-effectiveness, expertise, and more; while attorneys voted on these same items as well as integrity and whether or not they considered the law firm to be a worthy competitor. In addition to this great honor, Mary E. Tenn was listed in Best Lawyers, given recognition in Family Law. James J. Tenn, Jr., was given distinction in both Family Law and Family Law Mediation.